Clay Decor @ Rochester Home & Garden Show! Meet the artist, buy unique tile artwork (lovely tile trays, individual tiles and tile panels, hanging tile artwork) and see installed tiles on site! Let us help you create a custom project for your home or business. Would you like an Artist consultation? We are happy to provide free Artist consultations by phone or in person. If you would like an on-site consultation, please provide the address of your project or designer/builder location. Clay Decor Goes National with Wayfair! Clay Decor has partnered with Wayfair, one of the world's largest online destinations for the home! 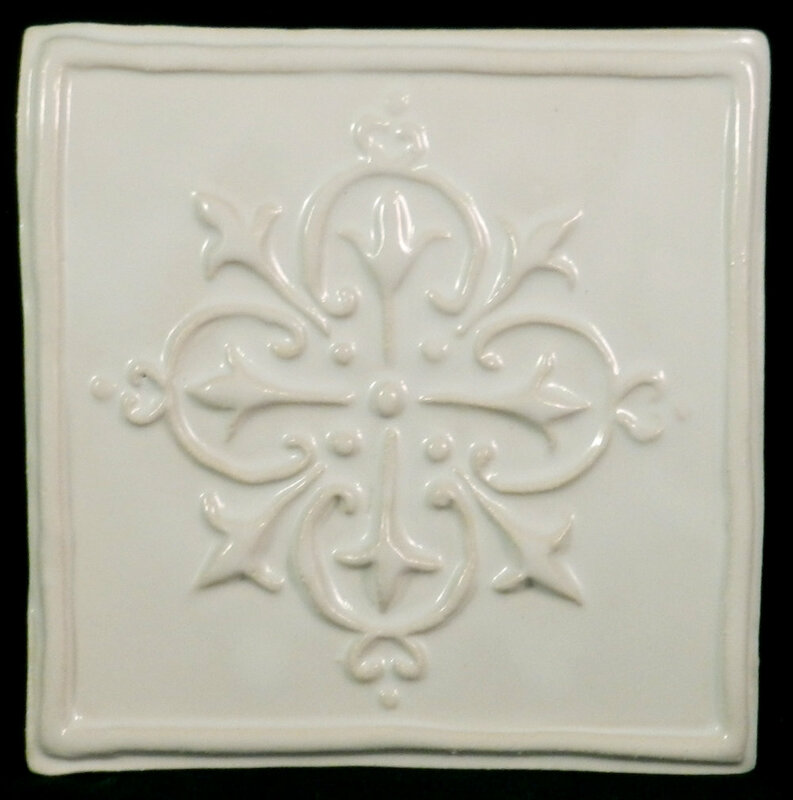 ACCESS by Clay Decor is a special line of designs from Clay Decor in Modern and Traditional Rustic styles in 6x6 to 9x9 sizes. 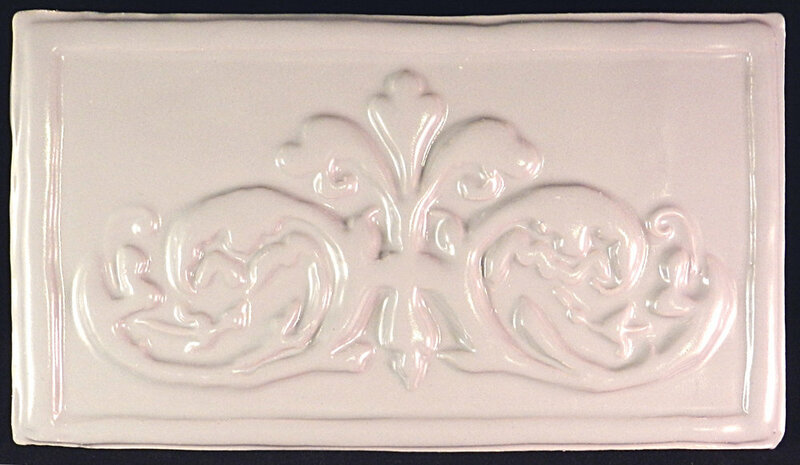 These elegant, 100% handmade tiles are offered in Gloss White and Gray artisan glazes. Custom frames, large-scale designs and more colors available from our exclusive retailers. We've brought together a combination of old and new designs in our French Country inspired collection. The animal tiles are taken directly from elegant 19th century lithographs, and the laundry tiles incorporate modern whimsy with a vintage feel. Looking for something no one else has? Clay Decor now offers one-of-a-kind works of art by Clay Decor artist, A.M. Foulke. These Crystal Creations are designs hand-sculpted into clay, then filled with melted glass. We can use our existing designs and a rainbow of glass colors, or create a completely new design to any dimension (individual pieces not to exceed 17 x 21 inches). Explore the possibilities below! Here are the latest additions to the Crystal Series; handmade ceramic tiles with carefully applied glass inlay. Every tile has a unique combination of artisan colored and clear glass, making each tile a single work of sparkling art. Sketches for You--Did You Know?? Did you know that we do line renderings of tile layouts regularly? There is a archive of these drawings on the Design Ideas page, under Layout Sketches. The sketches can give you new ideas, or help your clients visualize tiles together. We can also do renderings of new designs as part of a new project proposal! Thank you, Skippack tile for this project! Anne Foulke, the artist behind Clay Decor, LLC, has just uploaded new videos! Watch a clay tile being created, get a glimpse into the studio, or check out how glass tiles are made! Meet the latest in modern classic combinations: commercial mosaic tiles and handmade tile medallions with frames. 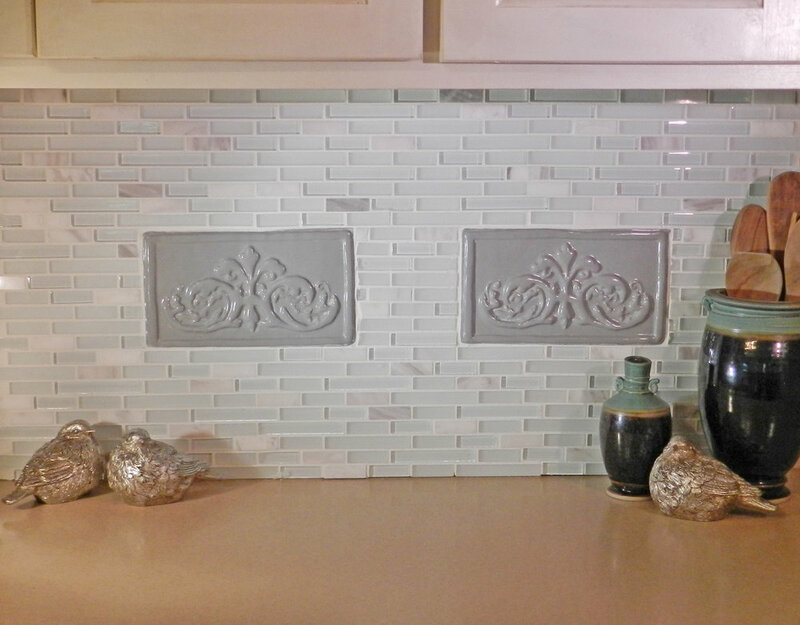 Mosaics are a popular trend in backsplashes for their beauty and ease of installation. The latest in kitchen design combines many materials, where stone, glass and ceramics live in harmony. With all the choices in mosaics and customization in handmade artwork, homeowners are able to create completely unique personalized spaces. 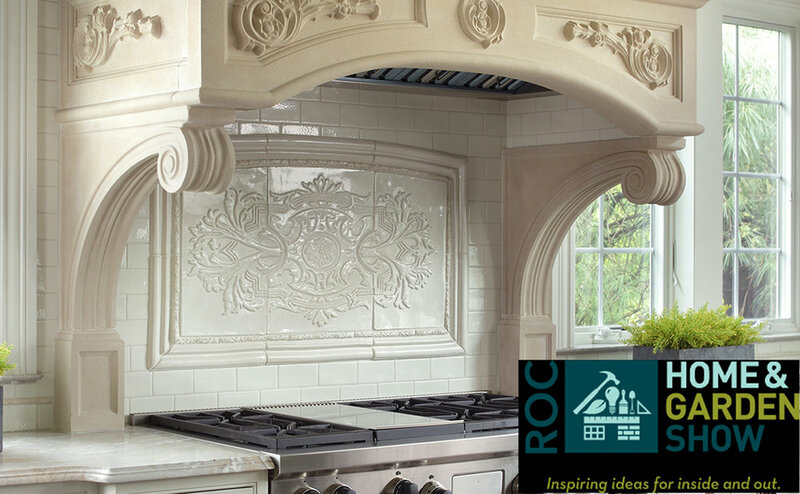 Handmade tiles are the ultimate in couture: Clay Decor offers custom designs, custom sizing, custom glazes, and custom shapes. Throw in a dash of mosaics, and watch your kitchen sparkle!! Unusual mosaic tiles set in a herring bone pattern work well with a custom-cut handmade medallion. 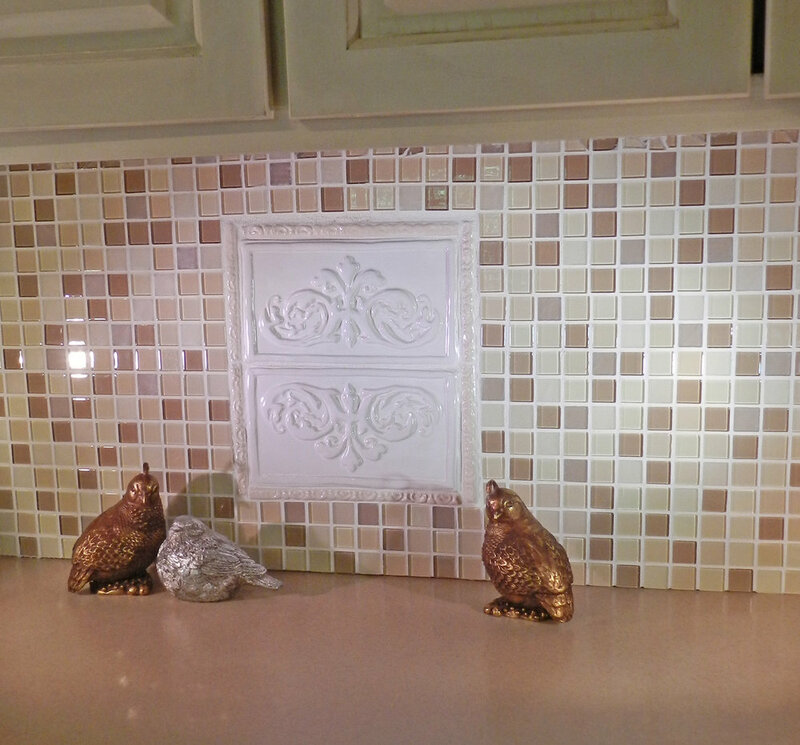 The tile was originally a rectangle, but cut to an oval, and paired with handmade molding frames. Here is the latest custom commission; a family coat of arms made into a mural, and custom sized to the client's space! This mural has three parts, and it roughly 23 x 17 inches. Chair Rail molding frames the work as a finishing touch, making the total size 28 x 22. Thank you to all who attended for making this year's Pottery Fair a great success!